Healthy Halloween Snacks: 10 Ideas That Are Healthy, Delicious, & Fun! Halloween is not known for being healthy. But you can please kids of all ages with these creative, healthy Halloween snacks and treats. The season of costumes, jack-o-lanterns, and stomach-turning amounts of candy and sweets is upon us. Food is a huge part of this American holiday. But instead of piling on the sugar and other unhealthy ingredients, try some sweet and savory food ideas that are packed with plants, equally as playful as typical treats, and deceptively good for you. These spooktacular healthy Halloween snacks and treats will make you scream — not because they’re frighteningly unhealthy — but because they’re surprisingly good for you, tasty, and full of fun. Need an eye-catching hors-d’oeuvre for your Halloween party? Look no further than Jackie Sobon of Vegan Yack Attack’s Stuffed Mushroom Eyeballs. Filled with tofu ricotta and topped off with sundried tomatoes and olives, these frightening fungi are sure to be a creepy crowd pleaser. It’s alive! Avocado toast gets a monstrous makeover thanks to Vegan Chow Down’s Frankenstein Avocado Toast recipe. It even incorporates an unexpected ingredient: seaweed! Want to play the ultimate trick this Halloween? Serve up deviled eggs — without the eggs! Kathy Hester’s Deviled Purple Potatoes taste eerily similar to the real thing thanks to a secret ingredient: kala namak, also known as black salt, which gives it an eggy flavor. Phaseolus vulgaris, Allium sativum, pureed Sesamum indicum, and Cuminum cyminum. No these aren’t the ingredients for a potion; it’s just Susan Voisin’s recipe for Spooky Black Bean Hummus. How do mummies get their kids to eat more veggies? They cut them into fun Halloween shapes and roast them like Live Eat Learn. Putting the “finger” in finger food, these Raw Witches Fingers are sure to cast a spell on any sweet tooth. This recipe is not only packed with a variety of healthy nuts, dates, and cocoa powder — it’s also free of refined sugar. Here’s a mouthwatering way to enjoy the many health benefits of apples. Cara at Fork and Beans put a spooky spin on the classic apple and nut butter combo with these Apple Sunbutter Teeth Bites. Instead of traditional peanut butter, this recipe uses sunbutter (made from sunflower seeds), a great nut-free alternative for those who have nut allergies. Who says candy corn has to be made out of candy? The iconic Halloween candy gets a plant-based update courtesy of Amelia at Bit Square. Using only three ingredients, these fruit kebabs make the perfect, guilt-free treat. Pumpkins aren’t the only things you can carve for Halloween! Apples provide the perfect carving canvas for these Peanut Butter Apple-Lanterns. Even the pickiest ghouls would eat these up! Not all Halloween treats have to be scary. Dreena Burton’s Pumpkin Chia Pudding perfectly captures the flavor of fall in a parfait cup. 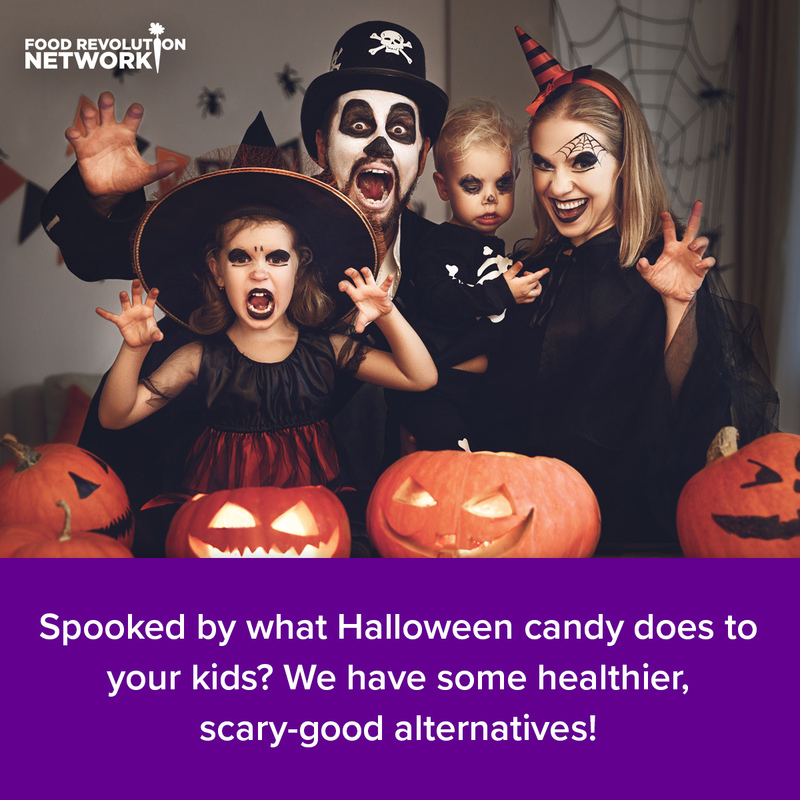 Now that you have ideas, you can see that healthy Halloween snacks and treats aren’t only witchful thinking! Be sure to carve out some good times and try a few of these creations or be fearless and create your own. 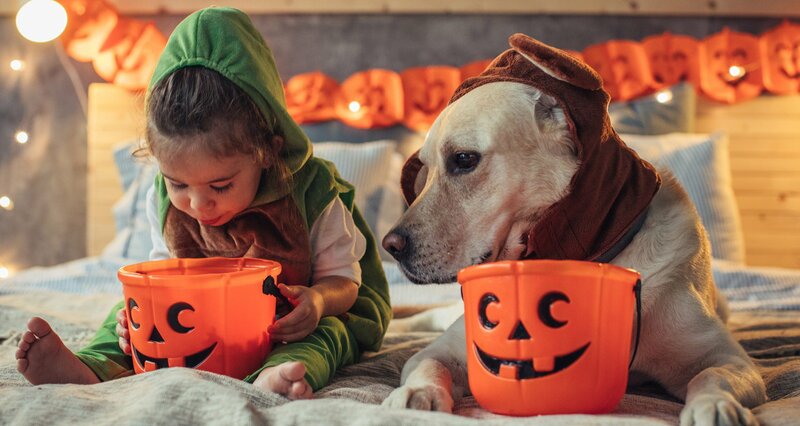 What are your favorite healthy Halloween snacks or treats? And if you try these recipes above, we’d love to know what you think!